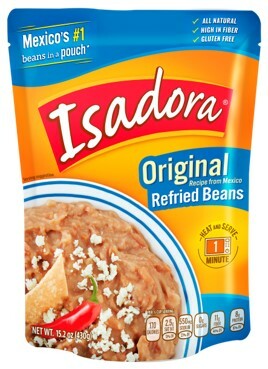 Isadora has revolutionized the way to eat beans by introducing the refried beans in a pouch. The best-ready-to-eat beans with no added conservatives and sterilized to ensure your safety. Isadora beans look, feel and taste just like homemade. Our refried beans Original Recipe are traditional in Mexico. They have the delicious home cooked bean flavor, made with small amounts of oil and a touch of onion and spices. Try them by themselves or add a personal touch. * 1. Would you consider yourself to be Hispanic or Latino? * 2. If you are interested in receiving an Isadora Refried Bean sample, please enter your email here to see if you qualify. Enter the email address you use for your Digitry account.